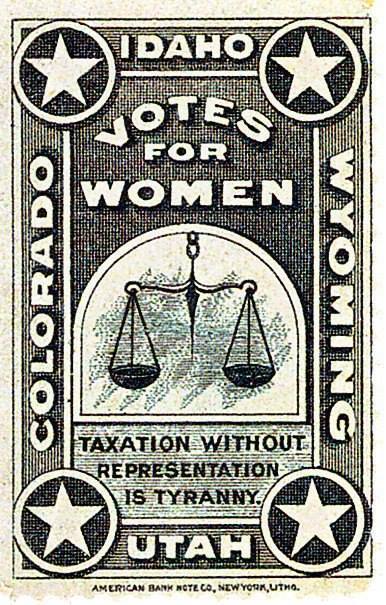 A privately-minted stamp (to be used alongside regular postage) put out by suffragists celebrating the four States in which women can presently vote on the same basis as men. The National Federation of Democratic Women was formed in October 1971, when 27 women gathered at breakfast during the Democratic Women’s Leadership Conference at the Capitol Hilton in Washington, D.C. Rilla Moran was elected temporary chair and the group set May 1972, in Nashville, Tennessee as the first annual meeting. Rilla Moran (from Tennessee) was elected the first President of the Federation at the May 1972 meeting and served until 1977 when Jean Ohm of South Dakota was elected President. At this convention, the women of the Federation established the Founders Internship for a young woman between the ages of 18 and 25 to work at the Democratic National Committee. During the period 1972-1977, the Federation gained recognition from the Democratic National Committee as the official women’s organization and received a seat on the DNC Executive Committee and three seats on the DNC. Rilla Moran Woods, C. DeLores Tucker, and Caroline Wilkins were instrumental in establishing this official recognition for NFDW through their work on the Charter Commission and the 1976 Convention Committee. You can find out more information about the NFDW at their website.